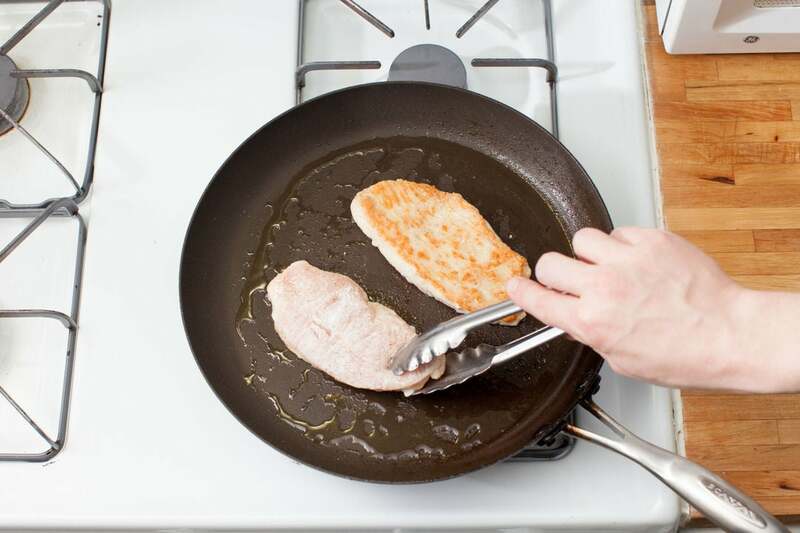 A good pan sauce can turn simple, pan-fried meat into a succulent, delicious meal. It’s no exaggeration. Deglazing the browned bits left in the pan (called ‘fond,' the French word for ‘bottom’) and simmering them with stock and herbs creates an almost magical, intensely flavorful sauce that puts this dish over the top. It’s one of our favorite techniques. Wash and dry the fresh produce. Heat a medium pot of salted water to boiling on high. Trim off and discard the stems of the Brussels sprouts; pluck off the bright, green leaves until you reach the lighter cores; place the leaves in a small bowl and discard the cores. Peel and mince the garlic. Pick the lemon thyme leaves off the stems; discard the stems. Peel and slice the shallot into rings. Trim off and discard the woody ends of the asparagus stems, then cut the spears into 2-inch pieces on an angle. Once the water is boiling, add the potatoes. Cook 14 to 16 minutes, or until cooked through but still somewhat firm. 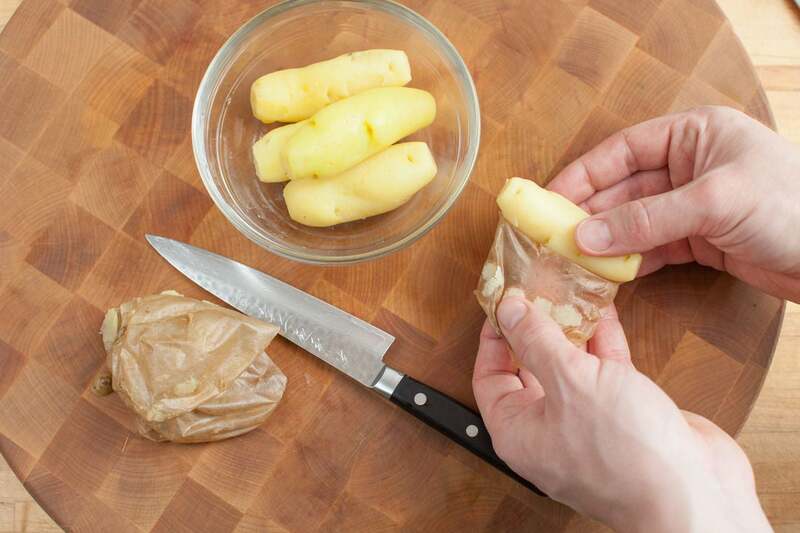 Drain thoroughly and transfer the cooked potatoes to a bowl of cold water to stop the cooking process. When cool enough to handle, using a paring knife, peel off and discard the skins. Cut the potatoes into bite-sized pieces. In a large pan (nonstick, if you have one), heat 2 teaspoons of oil on medium-high until hot. 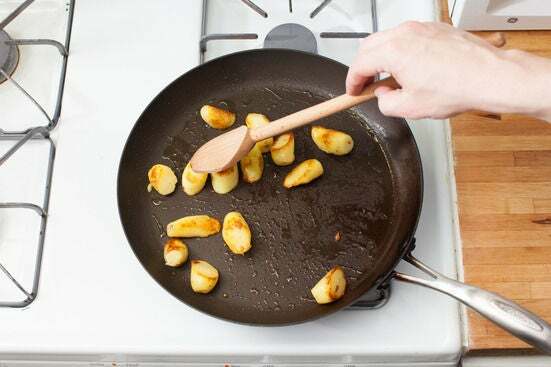 Add the peeled potatoes and cook, stirring occasionally to ensure even browning, 2 to 4 minutes, or until golden brown. Season with salt and pepper and transfer the browned potatoes to a paper towel-lined plate. Wipe out the pan. In the same pan used to brown the potatoes, heat 2 teaspoons of olive oil on medium-high until hot. 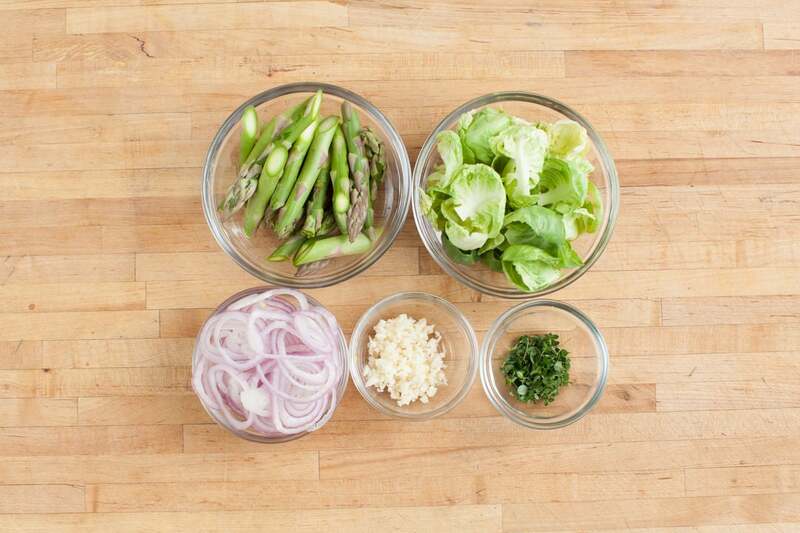 Add the asparagus and cook 1 to 3 minutes, or until bright green and slightly tender. Season with salt and pepper. 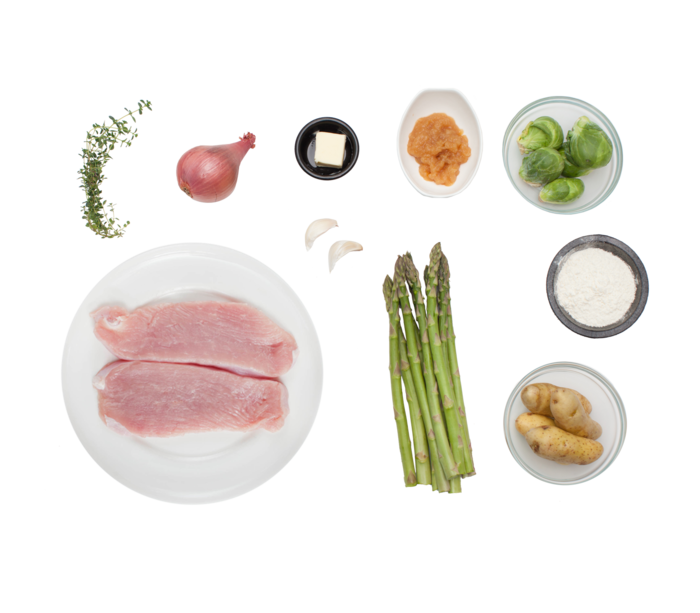 Transfer the cooked asparagus to the same paper towel-lined plate as the potatoes. Wipe out the pan. Season both sides of the turkey cutlets with salt and pepper then completely coat with the flour, shaking off any excess. 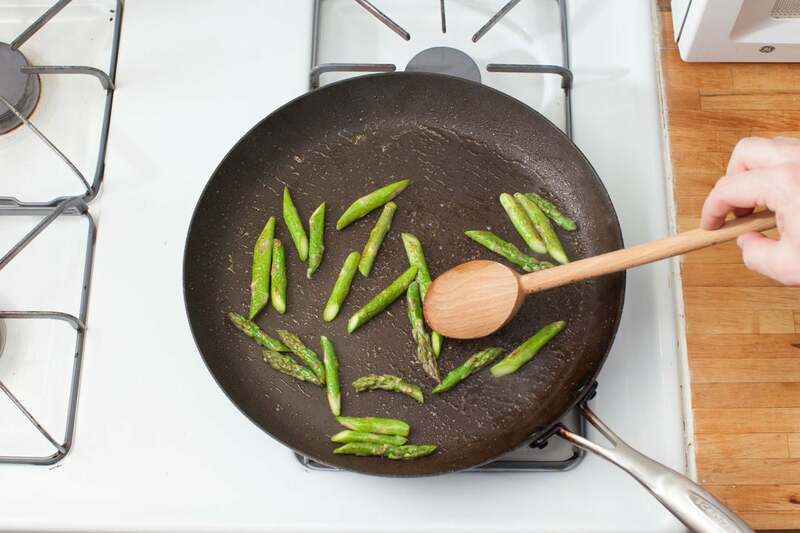 In the same pan used for the asparagus, heat 2 teaspoons of olive oil on medium until hot. Add the coated cutlets to the pan and cook 2 to 3 minutes on the first side or until golden brown. Flip the turkey over and add the garlic and shallot. (If the pan looks dry, add another teaspoon of olive oil.) Cook, stirring occasionally, 1 to 2 minutes, or until the garlic is fragrant and the shallot has softened. 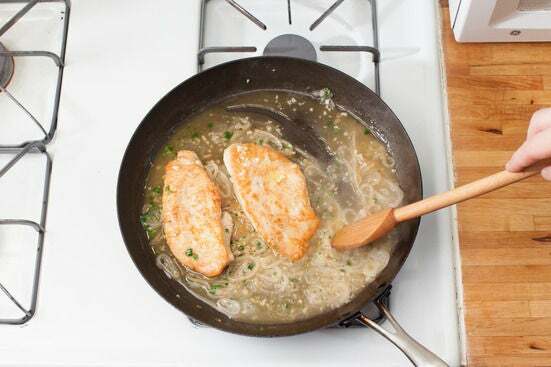 Using a spoon to scrape any browned bits from the bottom of the pan, stir in the chicken demi-glace, lemon thyme and ½ cup of water. Simmer 2 to 3 minutes, or until the sauce is slightly thickened and reduced in volume. 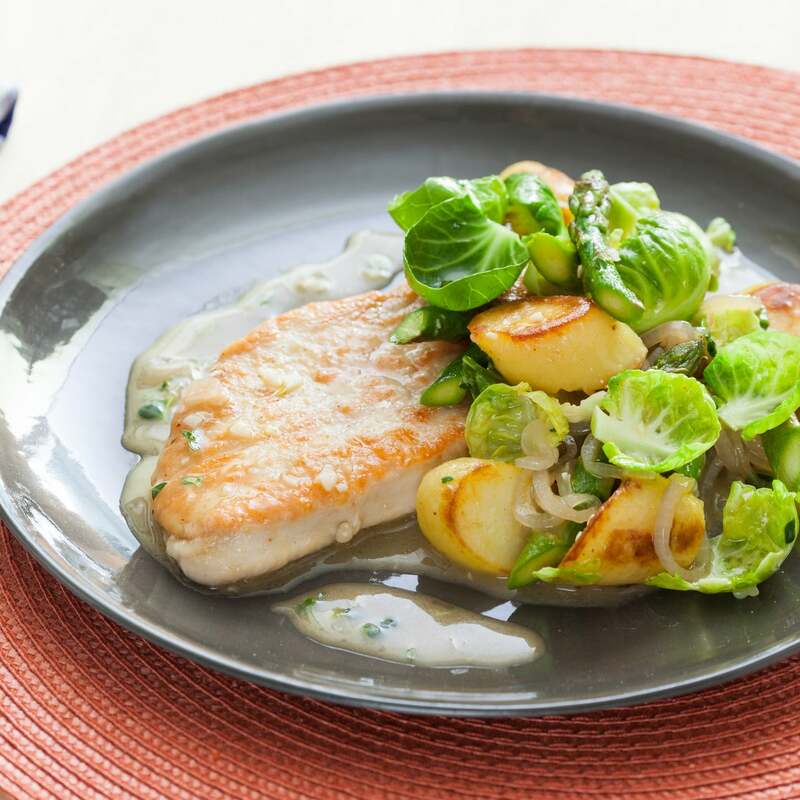 Remove from heat and stir in the butter, cooked asparagus, browned potatoes and Brussels sprouts. To plate your dish, divide the turkey, vegetables and potatoes between 2 plates. Top each plate with a few spoonfuls of the pan sauce. Enjoy!